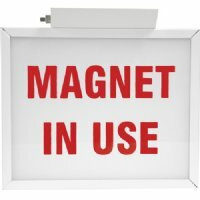 Choose from “MAGNET IN USE”, “MAGNET ALWAYS ON” or create a Custom Message. Sign must be hard wired in and comes with a battery backup. Comes with a spider plate for mounting-can be used on the top, side or back. Another way of mounting are t-bars when they connect it directly to a junction box. Two Sided and Custom Signs Available - call for pricing.